Directly east of College of Winterhold and northeast of Wreck of The Pride of Tel Vos, on an island. 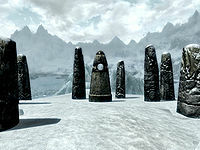 The Serpent Stone is one of the thirteen Standing Stones scattered across Skyrim. "Once a day, those under the sign of the Serpent can use a ranged paralyzing poison on opponents." 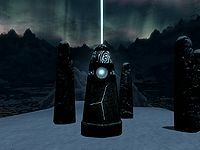 The stone is located on Serpentstone Isle, which is located directly east of College of Winterhold and to the northeast of Wreck of The Pride of Tel Vos. It is guarded by an ice wraith. The island is fairly empty, apart from a corundum ore vein on the southeastern shore, a couple of spiky grass plants on the northern shore, and the occasional snow fox. There are routes up from both the eastern and northern shores, to a squared arch at the top of a short flight of stairs, with the stone located beyond this.